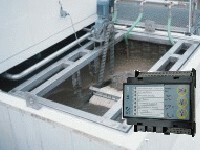 The aim of an annunciator system is to detect any unintentional operation condition. Everey discrepancy is analysed and starts a defined sequence in which the responsible persons are informed and other actions could be taken. Thanks to this quick and efficent information, there is enough time to start the necessary measures. The subsequent intervention prevents break downs, damages or other embarassing situations. A good example is the monitoring of a server room. The air-conditioning and the room temperature are controlled separately. A failure of the AC causes an immediate call to the technician responsible. If the temperature is still increasing and reaches a critial level, the IT-specialist receives an alarm. He is able to take the measures to prevent a breakdown or data loss.